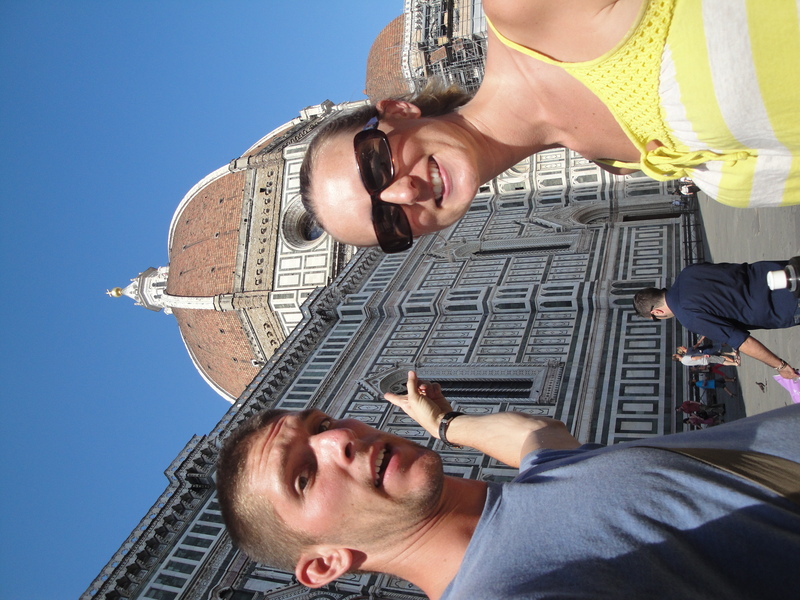 Firenze is what everyone calls this city who does not live in America. Not really sure when we decided to start calling it something else. I can’t say I blame us though. Florence sound much cooler than Firenze. Firenze sounds like some star trek alien species. Florence is much cooler. That is about where the coolness of this city ends with me though. After Cinque Terre it was a little disappointing to get back into a big city again. We are only here this one day and I am not that upset about that. We arrived in the town around 1300. We had our list of things our friends said we had to see. Knowing of nothing else to do we set out to see what the fuss was all about. Number one on the list was to see the statue of David. We made our way through town and into the line. After waiting for a while we were able to gain access to the art museum where it is housed. I knew it was too good to be true to think we could make it all the way through our Europe trip without setting foot in a museum. So close though. Oh well. Steph and I wandered the halls for a while feeling very cultured. We felt really sophisticated for a good 15 minutes until boredom kicked in. So we found our way to the main attraction. The statue of David. So this is a statue carved by Michelangelo into stone. Not really sure how he knew what David looked like, but he figured it out I guess. All the “people” say this statue is so impressive because the proportions are so accurate. Steph and I both thought his hands were too big for his body. But who are we? We discussed that we can appreciate the skill it takes to carve something like that, but no emotions of wonder swept over us. I guess ancient art just doesn’t cut it for these two Zarses. I was however tempted to buy one of the many pairs of boxers with David’s manhood on the front of them. Next on the list was this giant dome thing. Pretty sure it was another old church. I don’t think Europe has enough of these things yet. The line to get inside was pretty long so we settled on taking some pictures from outside and moving on. 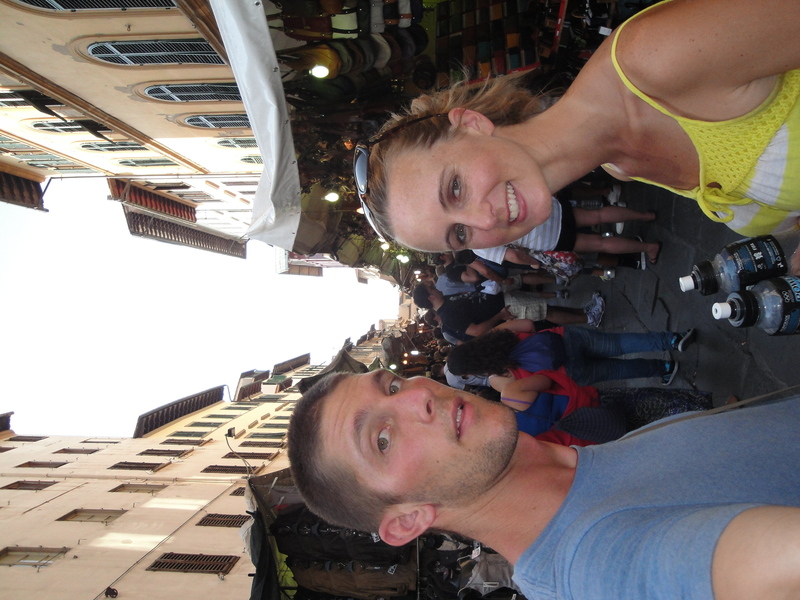 The last thing we had to do for the day was go to the San Lorenzo Market. This was pretty much a big tourist market. We wandered around for a while. Steph has been collecting magnets from every city she goes to. She wanted to get one from here. I told her to get the one with the statue of David. She said that she did not want to have a naked man on her fridge. I told her that if she got it I would make a tiny speedo to put on him so he would not be naked anymore. She agreed. Don’t know exactly how I am going to make a really tiny speedo but I guess I will figure it out. My purchase for the evening was a pair of aviators. I have been wanting a pair of these glasses but I have figured out that there is no reason for me to have a nice pair of sunglasses. Either broken or lost, sunglasses do not last long with me. So I needed a cheap pair. Well this is just the place for that. We found me a good pair and I had some fun negotiating with the guy. We finally settle on 10 euros. I hand him a 20, and he hands me back a 5 and some coins. Now in Europe this is not that uncommon. 1 and 2 Euro coins are very abundant and are given as change frequently. Well this guy thinks this is my first rodeo. He thinks I don’t know the difference between a 2 Euro coin and a 20 cent coin. He puts the money in my hand, closes my fist and says thank you. “No sir” I tell him. We have a friendly little joust of words, and I end up getting my correct change. As I leave the tent victorious I look around for my wife and she is no where to be found. Steph is not a big fan of confrontation, and thus when the first talk of money came up she fled the scene like she stole something. Not made for haggling my wife is. After the tourist market we went and found us a place to get some dinner. We eat a decent meal and retired to our hotel. Tomorrow we head off to Castiglion. This is a really small town. Should be a good time. This entry was posted in Europe and tagged florence, florence market, florence tourist market, statue of david, statue of david hands. Bookmark the permalink. Dang those lines…bummer you guys didn’t make it up the top of the dome church. It’s really narrow and winds around a lot, you would have loved it Scott.